The full chronology of events (e.g. transactions) that take place are tracked, allowing anyone to trace or audit prior transactions. The technology operates on a distributed, rather than centralized, platform, with each participant having access to exactly the same ledger records, allowing participants to enter or leave at will and providing resilience against attacks. The implications of such features reach far beyond blockchain’s original use in financial transactions. Any transaction, product life cycle, workflow or supply chain could, in theory, use blockchains. In the creative economy, blockchain can redefine how artists are remunerated by acting as a platform for creators of intellectual property to receive value for their work. A common complaint lodged by artists is that, as performance-rights organizations and new intermediaries such as YouTube and Spotify increasingly insert themselves into the value chain between artists and their audiences, artists receive smaller cuts of revenue and have less say over how their creative works are priced, shared or advertised. For example, on Spotify it would take between 120 to 170 streams for rights holders to receive their first penny. “Today, when anyone wants to pay for the right to play a song at a concert or the right to play a song in a movie, this causes quite a lot of transaction friction and takes time,” says Wences Casares, CEO of Xapo, one of the largest custodians of Bitcoin. “People end up doing it without paying or not doing it at all. Blockchains can host “smart contracts” to help artists manage digital rights and allocate revenue shares to contributors to the creative process. Such smart contracts have the potential to replace conventional contracts, which can be esoteric and leave some artists with little power over the terms for the content they generate. Royalties could be designed to be more inclusive, offering fairer terms for musicians, lyricists and composers — all stakeholders involved in the creative process. PeerTracks is an example of a service for artists to seek immediate royalty payments and ownership of their content. The service works by attaching a smart contract to every song an artist uploads and dividing the revenue according to the terms the contract stipulates. One of the biggest appeals of blockchain is its public nature. All of the transactions for a creative work could be seen and validated, including who accessed the work and how much revenue the work is generating at any point in time. This will allow stakeholders to have a better sense of the overall value of the creative work that is being produced, all in the form of a digital ledger provided in the blockchain. Furthermore, blockchain will make it transparent who the owner of the creative material is. Services such as Ascribe.io offer to attribute ownership of creative works securely. The service works by providing each creative work with a unique cryptographic ID, verified with the blockchain. This means ownership can be traced and creative content securely shared. Creative content can be mispriced. By tracking the demand for creative content, pricing could be more dynamic. Prices for creative content could fluctuate according to supply and demand. Moreover, artists could control prices and have the ability to set prices themselves without having to go through a complex web of intermediaries. As the blockchain could provide records of who has been granted access rights to creative works, this could then be harnessed to price creative works dynamically. Perhaps more importantly, because artists will be closer to their creative work than before, they may have a stronger voice in the pricing scheme and could, therefore, provide discounts on their works at certain times. iTunes and other digital music stores allow consumers to purchase individual song tracks. Using blockchain, snippets of creative works could be made available for a price, for example, a few seconds of a song for use in a movie trailer. This kind of “micrometering” works by having the blockchain record the precise components of the creative work that were used, defining the smallest consumable unit of creative content. This could have huge implications: why purchase unneeded parts of creative material? Already, services such as Streamium are disrupting the traditional method of artists being remunerated through intermediaries by offering micrometering payment services. In advertising, Brave allows internet users to pay content providers they support in Bitcoins in exchange for an ad-free experience. “It allows users to support content creators of their choice and reduce unwanted ads,” says Mike Belshe, cofounder and CEO of BitGo. Blockchain can help link reputations to specific “addresses” on the blockchain, thus allowing both producers and consumers of creative content to verify one another. This could encourage stronger collaboration and better behaviour, by promoting cooperative terms for content creators and consumers alike. Participants who repeatedly don’t fulfill terms in a contract or try to game the system would have their actions recorded, acting as a deterrent against bad behaviour. 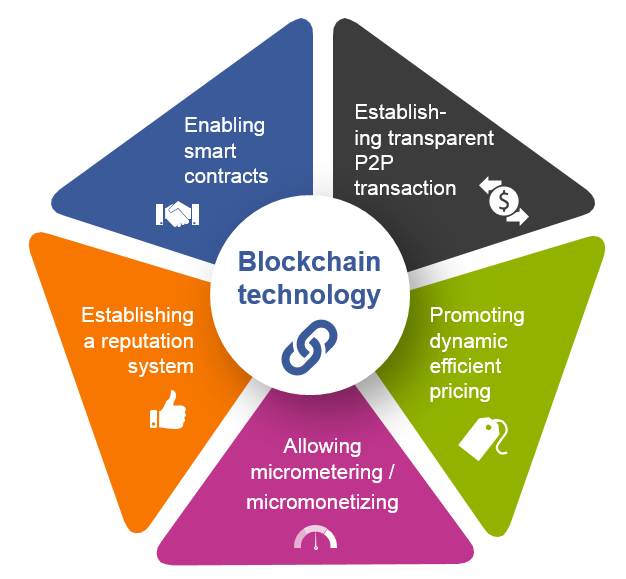 Despite the benefits offered by blockchain, several challenges remain for the technology. More ubiquitous use of blockchain technology will require solutions to “off-chain” issues, especially around business, technology and legal challenges. Licensing issues and challenging the status quo: While some artists such as Zoe Keating and Imogen Heap embrace blockchain as a way to release tracks with greater control over the terms of their creative work, blockchain-ready artists remain a small minority. It is not yet clear what threshold of artists will be big enough to disrupt the status quo, where distributors, record labels, and other intermediaries have established terms, including stipulations for payments and use. Artist promotion: While blockchain may provide creators with a larger say and stakes in the revenue generated from their creative content, questions remain as to what extent they can market and promote their creative content without the help of traditional agents, be it publishers or record-label companies. There are concerns that self-publishing or self-promoting material may, in fact, lead to less revenue for some artists who would otherwise benefit from agents’ support. “On-chain” versus “off-chain” storage: Questions remain about where the creative media will be stored — on the blockchain itself, as metadata, or in the form of access keys? Current technology may constrain putting creative content directly on the blockchain; while storing just the metadata of the creative content presents issues of where the creative data will actually be stored and how it will be disseminated. Methodology for micrometering/micromonetizing: Bitcoin itself is not originally designed for micropayment features, thus requiring an off-chain “layer” that handles payment. Intellectual-property (IP) frameworks: Governments and IP rights consortiums will need to define legal frameworks recognizing transactions conducted using blockchain. While blockchain technology provides the means for keeping a record of the property holder, we may still need to rely on traditional mechanisms to enforce owners’ rights, especially when contracts are not upheld. Governance/permissions: There are also questions concerning whether the blockchain in the creative economy should be public or private. If the public blockchain route is taken, the data stored in the blockchain will, by definition, be accessible to all participants in the network. This could present IP concerns if creative content is stored directly on the blockchain. On the other hand, if a private blockchain is chosen, issues around governance — in particular, permission rights — will remain. In the private blockchain scenario, an important question is who will fund the new system? If traditional agents, such as record labels, develop the infrastructure, then there may be little change in how artists are remunerated. “We need to develop software that will allow artists to directly record the digital characteristics of their art onto the blockchain,” says Dr. Kenji Saito, a lecturer on blockchain at Keio University. What can blockchain be used for, other than Bitcoin? Blockchain holds enormous potential to break down barriers that could lead to more efficiency, greater accountability, lower costs and increased remuneration for artists. To reap these benefits, however, the technology will need to be developed responsibly within the right regulatory frameworks. “We need to fund centres of competency around blockchain technology that cut across agencies and functions, develop the talent to understand blockchain and encourage regulators to co-create the solutions using blockchain,” says Brian Behlendorf, executive director of the Hyperledger Project at Linux Foundation. This is part of a series of articles related to the disruptive effects of several technologies (virtual/augmented reality, artificial intelligence, and blockchain) on the creative economy. The author would like to thank Brian Behlendorf, executive director, Hyperledger Project, Linux Foundation; Mike Belshe, co-founder and CEO, BitGo; Wences Casares, CEO and founder, Xapo; and Kenji Saito, lecturer, Faculty of Environment and Information Studies, Keio University, for their expert input as well as experts at McKinsey & Company, in particular Dan Singer, Partner, New York; Jonathan Dunn, Partner, New York; and Matt Higginson, Partner, Boston for their input and comments on this article.